Sunday, December 17, 2017, 4 p.m.
Suzie LeBlanc sings amorous madrigals by Claudio Monteverdi, Barbara Strozzi, Stefano Landi, and others, her lithe soprano voice backed up by an ensemble featuring the bold addition of setar and percussion. Interspersed are Giovanni Girolamo Kapsberger’s quirky and imaginative instrumental pieces. To salute the season, music for the nativity rounds out this lively program. The ensemble is supported by the Conseil des arts et des lettres du Quebec, the Canada Council for the Arts, and the Conseil des arts de Montréal. Constantinople is the story of a musical ensemble that chose the journey as its cornerstone. It makes geographical journeys and also historical, cultural, and inner journeys. It seeks inspiration from all sources, aiming for distant horizons. Inspired by the ancient city that illuminates both East and West, the ensemble was founded in Montreal in 1998 as a forum for encounters and cross-fertilization. 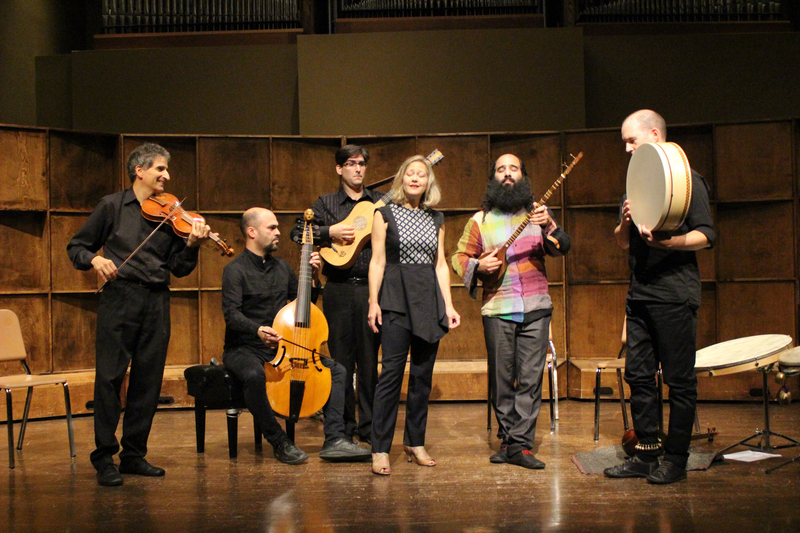 Since then, as seasoned travelers, the musicians of the ensemble have explored a wide range of musical avenues from medieval manuscripts to contemporary aesthetics, from the European traditions of the Mediterranean, to Eastern traditions, to New World Baroque. Constantinople is regularly invited to international festivals, where it is acclaimed by the public, music professionals, and critics alike. It has performed on many of the world’s major stages, including Salle Pleyel (France), Berliner Philharmoniker (Germany), Festival d’Aix-en-Provence (France), World Sacred Music Festival of Fez (Morocco), Festival d’Île de France (Paris), Onassis Centre (Athens), Festival de México en el Centro Histórico (Mexico), Festival de Lanaudière (Quebec), and Schwetzingen Festival (Germany). Alongside tours in France, Italy, Portugal, Spain, Belgium, Holland, Romania, Greece, Turkey, Lebanon, Iran, Cyprus, Morocco, Canada, United States and Mexico, Constantinople presents an annual concert season in Montreal that features its own creations. Constantinople’s popularity continues to grow. Over the course of the decade, the Constantinople has created over 35 works and traveled to nearly 125 cities in 24 countries. Kiya Tabassian was born in 1976 in Tehran, Iran. He immigrated to Montreal in 1990. He trained in Persian music under Reza Ghasemi and Kayhan Kalhor. He studied musical composition at the Conservatoire de musique de Montréal with Gilles Tremblay. In 1998, he co-founded Constantinople, a Montreal based ensemble, which has earned an international reputation for its unique juxtaposition of early music and the living traditions of the Middle East. He has recorded fifteen CDs for a number of labels: ATMA, Analekta, Buda Musique, World Village, and Ma Case. With Constantinople, he has created over thirty-five original programs. Soprano Suzie LeBlanc is one of the most sought-after early music sopranos of her generation, as well as a gifted interpreter of lieder, French mélodies (19th-century art songs), Acadian repertory, and contemporary music. Concert engagements have taken her around the world. She has also made over fifty recordings with the world’s leading early music ensembles. On the opera stage, she performed for De Nederlandse Opera, Festival de Beaune, Opéra de Montréal, Boston Early Music Festival, Tanglewood, and Early Music Vancouver. She is the recipient of four honorary doctorates for her artistic achievements. She also played the lead role in the award winning film Lost Song (Best Canadian Feature Film at the Toronto International Film Festival in 2008). She founded Le Nouvel Opéra with Alexander Weimann and Marie-Nathalie Lacoursiére. It offers workshops in baroque opera at the Orford Arts Centre, Quebec, and produces chamber operas.